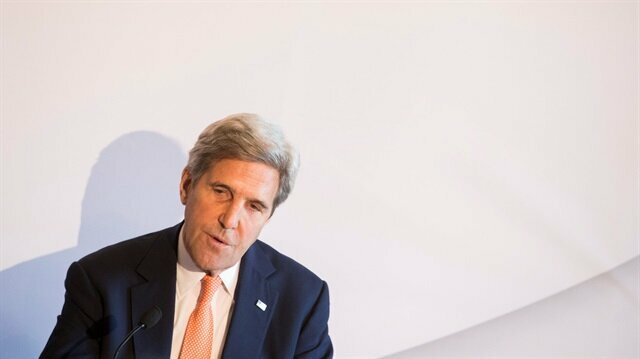 Former Secretary of State John Kerry ripped America's sitting chief executive Wednesday, calling President Donald Trump's criticisms of NATO and Germany "strange" and "counterproductive." "It was disgraceful, destructive, and flies in the face of the actual interests of the United States of America," Kerry said in a statement released shortly after Trump's haranguing of the transatlantic alliance and singling out of Germany during a summit in Brussels. During the meeting of the 29-member alliance Trump suggested Germany is "totally controlled" and "captive to Russia," pointing to its use of Moscow's fossil fuels. "I think it's very sad when Germany makes a massive oil and gas deal with Russia, where you're supposed to be guarding against Russia, and Germany goes out and pays billions and billions of dollars a year to Russia," Trump said. "Why are countries in NATO, namely Germany, having a large percentage of their energy needs paid to Russia and taken care of by Russia?" NATO will continue to monitor and assess ballistic missile threats to Turkey from Syria, according to a declaration issued Wednesday, after the first day of the NATO summit in Brussels. "We remain concerned that Turkey has been hit three times in the last four years by missiles launched from Syria. We continue to monitor and assess the ballistic missile threat from Syria," it said.Pointing to Syria's inventory of short-range ballistic missiles, the declaration said the range of these missiles "covers part of NATO’s territory and some of our partners’ territories".Analysts: Turkey to play decisive role in Middle EastIt also drew attention to the Syrian regime’s use of these missiles extensively against its own population. "The increasing threat posed by the proliferation of ballistic missiles in the vicinity of the south-east border of the Alliance has been and remains a driver in NATO’s development and deployment of a ballistic missile defense system, which is configured to counter threats from outside the Euro-Atlantic area," it added.The two-day NATO summit opened with the attendance of 29 NATO heads of state and governments who will make important decisions on the future of the alliance.NATO chief says despite differences, alliance 'stronger together'NATO also vowed to provide Turkey with “tailored assurance measures” aimed at guaranteeing the alliance’s security"Tailored assurance measures for Turkey to respond to the growing security challenges from the south contribute to the security of the Alliance as a whole, and will be fully implemented," the declaration said. "We have increased the strength of the NATO Response Force, and the Very High Readiness Joint Task Force (VJTF) is ready to deploy on short notice," it added.Since 2014, NATO has implemented Assurance Measures (AM) which comprise a series of land, sea and air activities in, on and around the eastern part of Alliance territory.In late 2015, NATO allies agreed on a package of Tailored Assurance Measures for Turkey (TAMT) to respond to the increasing security challenges on Turkey’s borders.These measures include an additional AWACS (Airborne Warning and Control System) surveillance aircraft presence in the region; increased maritime activities in the Eastern Mediterranean; and Intelligence, Surveillance and Reconnaissance activities and information sharing.- North Korea and IranThe declaration welcomed the recent meetings and declarations between the leaders of the Republic of Korea and the Democratic People’s Republic of Korea (DPRK), and between the leaders of the United States and the DPRK as a contribution towards reaching the final fully verified denuclearization of the DPRK in a peaceful manner.Regarding Iran, the declaration said NATO is concerned by Iran's intensified missile tests. "We are concerned by Iran’s intensified missile tests and the range and precision of its ballistic missiles and by Iran’s destabilizing activities in the wider Middle East region," the declaration said.The declaration condemned all financial support of terrorism, including Iran’s support to a variety of armed non-state actors.- Afghanistan and LibyaThe declaration also reaffirmed NATO's commitment to ensure long-term security and stability in Afghanistan. "We will continue our assistance by extending our financial sustainment of the Afghan forces through 2024," it said.The declaration encouraged Pakistan, Iran and Russia to contribute to regional stability by fully supporting an Afghan-led and Afghan-owned peace process.On the other hand, the declaration welcomed the commitment made by the Libyan parties to work constructively with the UN to hold inclusive, secure and credible elections, most recently at the May 29, 2018 Paris Conference.- Macedonia and BosniaThe declaration reaffirmed the commitment of NATO to the alliance’s open door policy and said NATO’s invitation to the former Yugoslav Republic of Macedonia is a tangible demonstration of this commitment. "We welcome the historic agreement between Athens and Skopje on the solution of the name issue. In line with our policy, we have decided to invite the government in Skopje to begin accession talks to join our Alliance," the declaration stressed.It added that full implementation of all prescribed internal procedures with respect to the agreement on the solution of the name issue is a condition for a successful conclusion of the accession process.The declaration added that NATO fully supports Bosnia and Herzegovina’s NATO membership aspiration and it is committed to the territorial integrity and sovereignty of a stable and secure Bosnia and Herzegovina.It also said that non-EU NATO allies continue to make significant contributions to the EU's efforts to strengthen its capacities to address common security challenges. "For the strategic partnership between NATO and the EU, non-EU Allies' fullest involvement in these efforts is essential," the declaration said.- Relations with RussiaThe declaration highlighted that Russia’s recent activities and policies reduced "stability and security, increased unpredictability and changed the security environment" and reaffirmed decisions towards Russia agreed at the Wales and Warsaw summits.The NATO leaders also condemned a nerve agent attack on Yulia Skripal, who was poisoned alongside her father, ex-Russian spy Sergei Skripal, in Salisbury in the United Kingdom in March. "The UK assesses that it is highly likely that the Russian Federation was responsible for the attack and that there is no plausible alternative explanation. We stand in solidarity with the UK in its assessment," the declaration added.NATO leaders also condemned Russia's "illegal and illegitimate annexation of Crimea" and reiterated support for the territorial integrity and sovereignty of Ukraine, Georgia and the Republic of Moldova within their internationally recognized borders. "The discrimination against the Crimean Tatars and members of other local communities must end. International monitoring structures must be allowed to carry out their essential work in view of the protection of human rights," the declaration added, calling for the full implementation of the Minsk Agreements by all sides and support for the efforts of the Normandy format and the Trilateral Contact Group.- NATO Readiness InitiativeThe declaration announced that allies "will offer an additional 30 major naval combatants, 30 heavy or medium manoeuvre battalions, and 30 kinetic air squadrons, with enabling forces, at 30 days’ readiness or less". "The NATO Readiness Initiative will further enhance the Alliance’s rapid response capability, either for reinforcement of Allies in support of deterrence or collective defense, including for high-intensity warfighting, or for rapid military crisis intervention, if required. "In the declaration, NATO leaders vowed to strengthen the ability to deploy and sustain forces and their equipment throughout the Alliance and beyond and also to improve military mobility by land, air, or sea as soon as possible, but no later than 2024.- NATO's military backboneThe declaration announced that far-reaching decisions to adapt and strengthen the NATO Command Structure, the military backbone of the Alliance, were taken.The declaration further announced the establishment a Cyberspace Operations Centre in Belgium "to provide situational awareness and coordination of NATO operational activity within cyberspace". "A Joint Force Command Norfolk headquarters in the United States" was also decided to be established to focus on protecting the transatlantic lines of communication, including "a Joint Support and Enabling Command in Germany" to ensure freedom of operation and sustainment in the rear area in support of the rapid movement of troops and equipment into, across and from Europe.- Nuclear deterrenceNATO allies decided to take steps to ensure its nuclear deterrent capabilities remain safe, secure and effective following changes in the security environment. "As long as nuclear weapons exist, NATO will remain a nuclear alliance," the declaration said, adding the fundamental purpose of NATO's nuclear capability is to preserve peace, prevent coercion and deter aggression.Underlining that the circumstances in which NATO might have to use nuclear weapons are extremely remote, NATO leaders also warned that any employment of nuclear weapons against NATO would fundamentally alter the nature of a conflict. He later reiterated his criticism on Twitter. Trump also took aim at "delinquent" NATO members’ defense spending, calling on allies to not only meet the minimum goal of spending 2 percent of GDP on defense, but urging them to double that to a total of 4 percent. In repeatedly sending such pointed barbs at NATO and Germany, Kerry said Trump "is steadily destroying our reputation in the world. He is undermining our interests. He diminishes alliances we built to safeguard an economic and strategic force that has allowed millions of people to live in freedom. "There's a time, place, and manner for raising issues with allies, and trashing them on camera in a way that calls into question the alliance itself isn't it," the former top diplomat said. "Enough. This isn't good for the United States and there are people across the aisle -- as the Senate vote yesterday clearly showed -- who know it and need to say it. Kerry was referring to Tuesday's Senate vote that overwhelming saw the chamber voice its support for NATO amid Trump's continued criticisms. He was not alone in questioning Trump's treatment of America's closest allies. While refraining from directly criticizing the president, House Speaker Paul Ryan, the chamber's top ranking Republican, told ABC News "NATO is indispensable." The House of Representatives later Wednesday approved by voice vote a bipartisan resolution expressing support for NATO. Democratic Representative Steve Cohen, who sponsored the resolution, said its passage sends "a strong message that, no matter what the President says during the NATO Summit in Brussels, Congress strongly supports our treaty allies." “Members of Congress understand, as our President clearly does not, the value of stability and certainty in our diplomatic relations and the threat of continued Russian aggression. I’m pleased the House has taken the step of formally stating its support for the alliance at this time,” Cohen said. Trump is slated to meet Russian President Vladimir Putin in Helsinki, Norway July 16 in what Trump said "may be the easiest" meeting on his four-nation trip. Asked if he sees Putin as a friend or foe, Trump said the Russian leader is a "competitor"